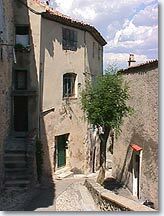 This magnificent little village situated between the Luberon and the Valensole plateau is one of the most beautiful in Haute Provence, surrounded by superb countryside. 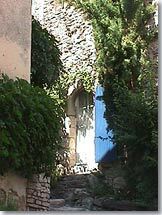 As soon as you pass through the village gate-ways, you will fall under the charm of Dauphin... you can slowly stroll through the cobble-stone streets which lead you under picturesque arch-ways. You will come across beautiful ancient stone houses, 16th and 17th century facades, sculptured doors and windowframes... everything has been restored with the utmost care. 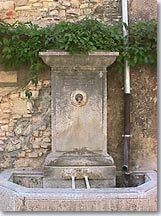 The village is a classified site and has preserved some beautiful historic remains: you will discover the ramparts with towers and covered gate-ways, the 16th century St Martin church and the ancient chapel of the chateau. 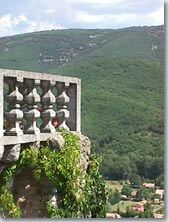 At any time of year visitors can climb to the summit of the keep to contemplate the breath-taking view of the Luberon and its surrounding forest-clad mountain range. 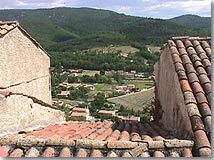 From the terrace of the historic chateau, you will have a superb view of the St Maime, and Mane villages, with the Forcalquier citadel visible in the distance. 15th century St. Martin church. 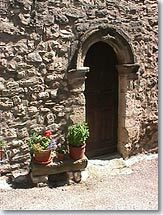 Passage-ways and door-ways "du Coulard". 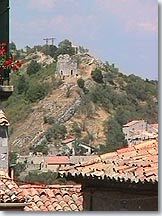 Keeps, ramparts and ancient streets. Hiking, mountain biking, horse-riding (signposted trails). Exhibitions, arts and crafts (pottery, ceramics, wood-turning...). Concerts in the church during July and August.